Want to travel but just not sure laying out a large amount of cash right now for all the obvious reasons? Hats off to companies like Crystal Cruises that understand what's happening in the world, and are coming up with creative ways to secure your bookings in a less painful way. 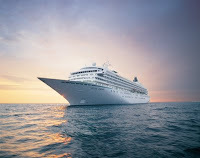 For example, for sailings on board its beautiful Symphony and Serenity ships, Crystal now requires only a 5 percent deposit instead of a 10, PLUS gives you 7 days instead of 3 to hold a cabin before it cancels out AND allows you to outright cancel up to 45 days instead of 75 days prior to sailing without any penalty at all. These "ease the pain" booking modifications are simply smart business in these tough economic times and will go a long way towards getting people to think more seriously about taking a fabulous Crystal Cruise to Asia (ask us about the free nights being offered in Beijing and the double-category upgrade on select sailings), Europe (we've got the skinny on the best-priced sail dates), the South Pacific, Mexico and beyond in the days ahead. NB: We can also fill you in on how you can get a complimentary cabin if you round up a few "friends and family" to set sail with you in 2009. Contact us to learn more about Crystal's Value Sail Dates, itinerary options and exclusive amenities/perks we can offer aboard select sailings worldwide.